The Fed has publicly stated it has a 2% inflation target, but inflation has been stubbornly uncooperative in reaching that level. The PCE price deflator moved above 2% earlier this year, but has since fallen back, bringing both the overall and core rates back to 1.4%. The latest Fed minutes show, yet again, that the Fed is concerned about weak price pressures. We’re harping on this subject both because it’s very important, and because it reveals a bit of a dust-up within the Fed. Apparently there has been an ongoing debate within the Fed over showing a united front or encouraging dissent. We, of course, go with dissent, so to us the current inflation debate is encouraging. Hale Stewart put together the following round-up of recent FOMC speak on that debate. … a diminished responsiveness of prices to resource pressures, a lower natural rate of unemployment, the possibility that slack may be better measured by labor market indicators other than unemployment, lags in the reaction of nominal wage growth and inflation to labor market tightening, and restraints on pricing power from global developments and from innovations to business models spurred by advances in technology. A couple of participants argued that the response of inflation to resource utilization could become stronger if output and employment appreciably overshot their full employment levels, although other participants pointed out that this hypothesized nonlinear response had little empirical support. Last week Bullard posted comments on the St. Louis Federal Reserve’s blog focused exclusively on the Phillip’s Curve, which argues that as unemployment decreases, wages increased. This relationship was first observed in the 1950s and became part of central bank policy making soon thereafter. While the 1970s stagflation experience soured the Fed on this theory, it returned to prominence in the 1990s. As many, including the gang here, have argued, the relationship between employment growth and wages is weak at best. 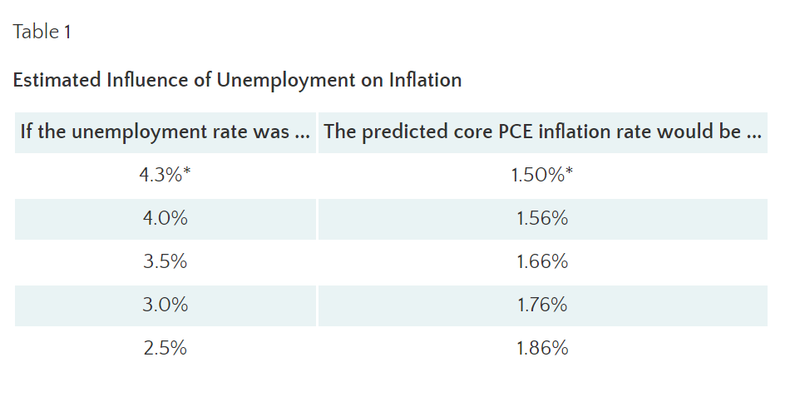 The table below shows that even a nearly impossible 2.5% unemployment rate would cause only a minimal increase in PCE inflation (36 basis points). This research indicates that a basic relationship assumed by the Fed is no longer supported by the data, if it ever truly was. One key factor that may have played a role in the past three years is the decline in import prices, reflecting the dollar’s surge, especially in 2015. By contrast, in the 2004‑07 period, non-oil import prices increased at roughly a 2 percent annual rate and had a more neutral effect on inflation. Nonetheless, while the decline in non-oil import prices likely accounts for some of the weakness in inflation over the past few years, these prices have begun rising again in the past year at a time when inflation remains relatively low. The trade-weighted dollar (in green, of course) decreased 25% between 2002-2008. At the same time, import prices rose at fairly sharp rates. The exact opposite happened during this expansion: the dollar increased a little over 30% causing import prices to contract from 2012 to the beginning of 2017. She also argues that underlying inflation–as well as inflation expectations–has decreased, which is best illustrated by the breakeven inflation rate, which subtracts the yields of TIPS, Treasury Inflation Protected Securities, from the corresponding treasury. The 5-year (in red) and 10-year (in purple) breakeven rate each fluctuated around 2.5% during the previous expansion. But each has decreased in fairly pronounced ways in the last 4 years. The 5-year has dropped about 100 basis points while the 10-year is down about 75 basis points. This graph indicates that people believe price pressures are declining, so they’re demanding less interest as compensation. The first theory has been advanced to explain Japan’s low inflation expectations, but while there is a correlation between the two statistical events, we don’t know if there is causation. The second is related to recent research from the San Francisco Fed, which observed that the natural rate of interest is abnormally low and has been for the duration of this expansion. Low interest rates can’t exist if inflation is high because at some point, the markets will demand sufficient compensation to the natural devaluation of this money. As we noted last week, the Fed moves at a glacial pace, so don’t expect a sea change in their collective inflation thinking. In fact, several other speeches this week indicate that some governors are continuing to argue low inflation is transitory. However, Bullard and Brainard have at least put the ball in play and offered substantive evidence supporting a rethinking of the Fed’s recent inflation targeting failures. And we believe they won’t drop that ball.